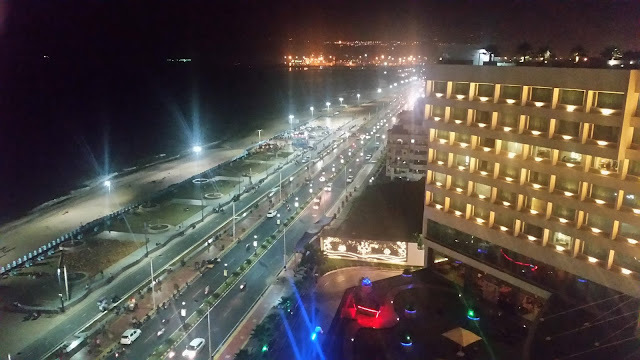 NH44 is the longest highway of India and passes through around ten states, starting from Kashmir and ending at Kanyakumari. Chef Manik Magotra and his team have curated a special menu for the festival, which has delicacies from many states through which the road passes. Care has been taken to maintain the authenticity of the dishes. A few select items from the promotion menu was served at the preview. We started with Aloo Dabara, a Kashmiri preparation. 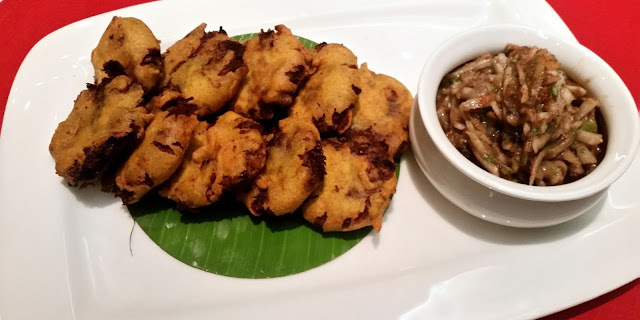 The besan fried mashed potato dish reminded me of our own Bengali Aloo Chop, though this version was much less spicy. The accompanying tamarind, onion and pomegranate chutney was a hit, in fact, I could not help but try out a whole tablespoon of the same. Next were a couple of dishes from Punjab. The Tawa Paneer Tikka was presented very nicely, and the taste lived up to the look. 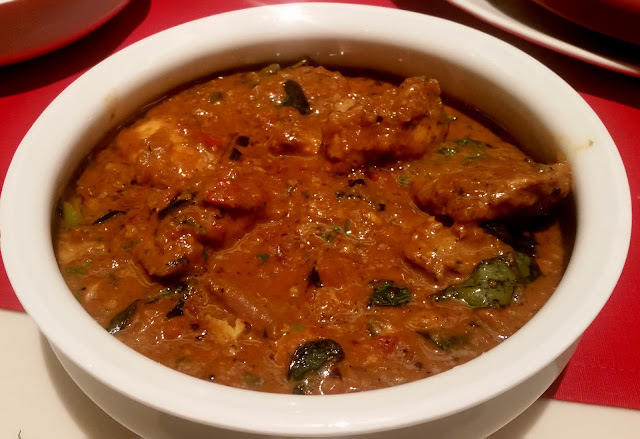 The paneer, which was well marinated in dahi and masala was soft and of very good quality. The dish was served with pickled onions, which is again one of my favourites. 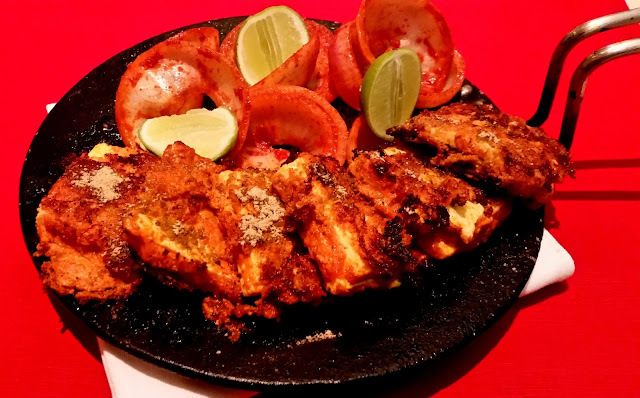 Bhatti Da Murgh, one of the best-known dishes from Punjabi cuisine, was served in a spicier avatar. 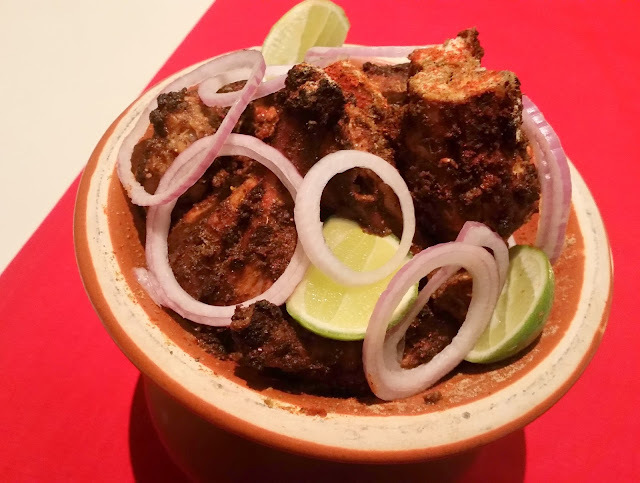 Chunks of tandoori chicken were served doused in a rich masala. I was at that time nursing a Patiala Peg, a whisky cocktail with cinnamon and cardamom, and the paired end result was kind of explosive. But, still, I could not but admire the taste of the dish. 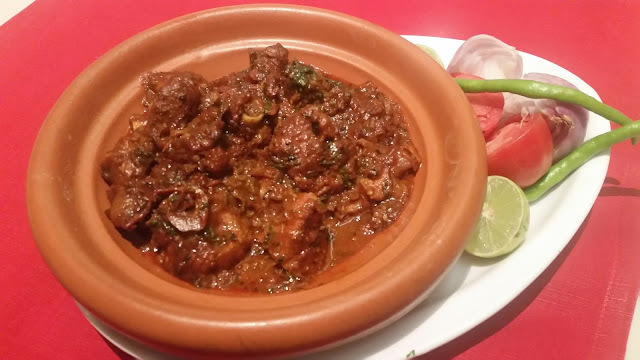 Talawa Gosht from Hyderabad was the last starter served. 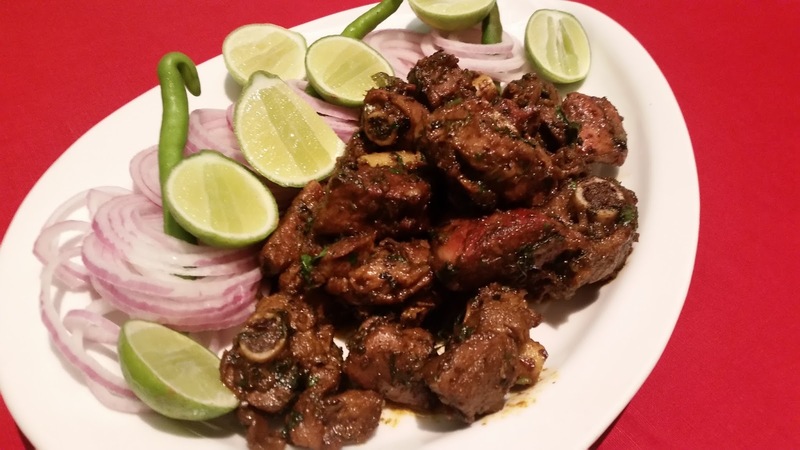 A very authentic preparation, though I would have loved if the mutton pieces were a bit smaller to soak in the masala. The main courses were brought out together and served with an assortment of Indian breads. The pick of the evening was easily the famous Langarwali dal, which is served in the langars of Gurudwaras across Punjab. The greenish dal was absolutely comfort food, and I enjoyed it on its own apart from pairing it with a soft naan. 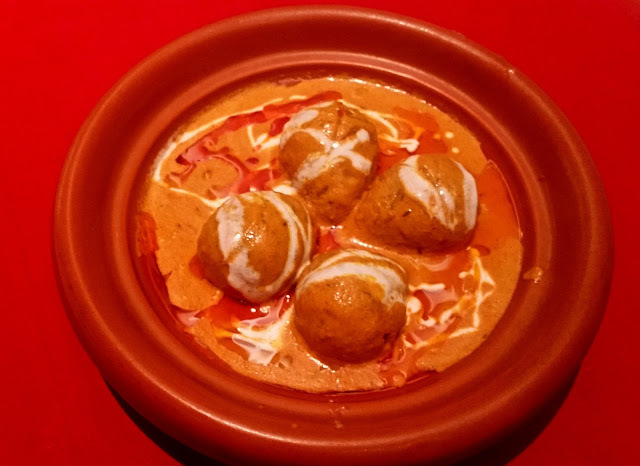 The two vegetarian dishes among the main courses were Jimikand ke Kofte and Gutti Vankaya. Jimikand or yam is a popular vegetable in Punjab and Himachal. Here the vegetable was boiled and mashed with potato into balls stuffed with nuts and prepared in a tomato gravy. The creamy gravy here was clearly a winner. The stuffed eggplant preparation from Andhra Pradesh was not as spicy as we usually get in Andhra restaurants. Punjab was represented well on the menu today, the last dish being Dhaba Gosht, a runny lamb curry popular in the Punjabi dhabas. The gravy, though not too rich, surprised me with its earthy taste. Meen Kuzhambu, a preparation from Tamil Nadu, was hot and tangy, and quite different from the rest of the dishes. It was clearly a preparation to be enjoyed with some steamed rice. 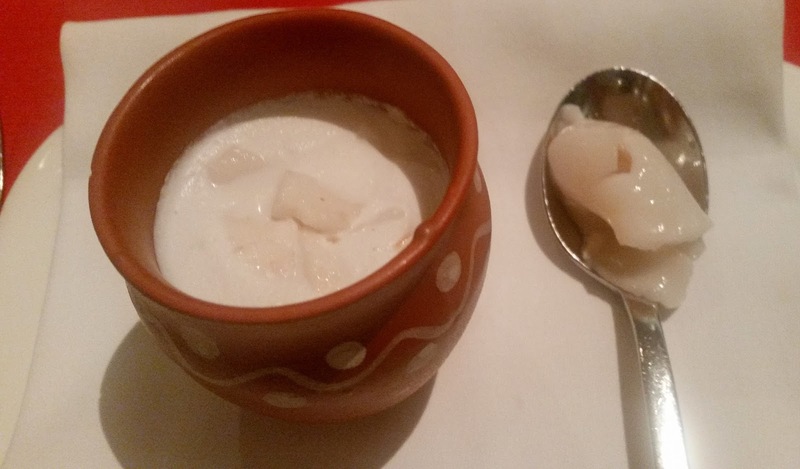 The dessert of the day was Elaneer Payasam, which was essential a bowl of mild kheer served with soft coconut meat scooped from insides of a tender coconut. Overall a very interesting promotion. In a way, the dishes showcased represent the diversity of India. 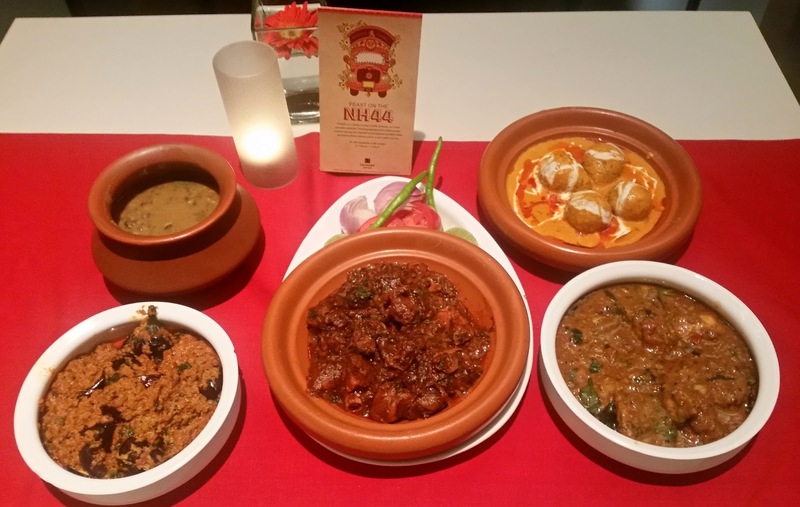 From the menu, a few more dishes which looked interesting were Tawa Bateir, Lucknavi Biryani, Lavang Lata and Kozhi Kuzambu. Since all dishes are a-la-carte, the diners have the freedom to either choose dishes from its entire journey, or some segments of it, for example, Central of South India. Either way, it would be a satisfying experience. 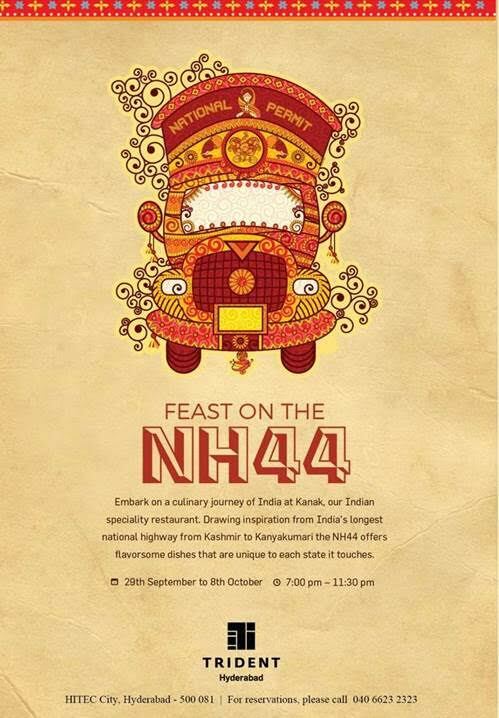 The festival is on till 16th October, only for dinner at Kanak, The Trident Hyderabad.